Risk roundup – This week’s edition of Cavalcade of Risk – edition #135 – is being hosted by The Notwithstanding Blog. In that several countries celebrate their independence in the month of July, our host has a suitably related theme that may test the breadth of your geographic trivia. Oh, and there are some good posts this week, too! Mark September 22 on your calendar now – Better yet, head on over to Business Insurance and register for Virtual Advantage 2011 – Workers Comp Trends & Cost Control Strategies. We’re very pleased that our own Tom Lynch will be participating on a blogger panel with three other blog luminaries: Roberto Ceniceros, Joe Paduda, and Mark Walls. There will also be a keynote by NCCI’s Harry Shuford, an expert panel on pharmaceutical cost controls for worker’s comp – and more. It’s a one-day virtual conference – and best of all – there is no charge to attend. Presumption – And speaking of Mark Walls, congrats to him on his first column in Risk & Insurance. If you don’t know Mark by name, suffice it to say he is the powerhouse behind LinkedIn’s popular Work Comp Analysis Group. In Not all claims are created equal he talks about the thorny issue of presumption and how presumption laws fiddle with a basic tenet of the workers compensation pact: that the burden to prove an injury or illness “arose out of employment” falls to the employee. Self Insurance – If the workers comp market continues to harden, as many are predicting, many employers might be looking to alternatives to the traditional insurance options. In Risk Management Magazine, Richard C. Frese, a consulting actuary from Milliman, tackles the topic in his article Does Your Self-Insured Program Need a Tune-Up?. It’s a good overview of what you need to know if you are considering the move. Employment law – Attorney Phillip Miles posts a handy SCOTUS Employment Law Year in Review 2011 – a summary of cases with links for more information. 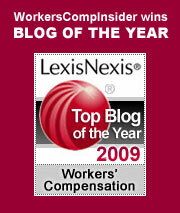 New blog discovery – check out Texas Mutual’s Blog. We particularly liked the recent post on The ABCs of new employee safety. This is an important issue – in their own claim analysis, they found that roughly 27% of job-related fatalities involve employees who have been on a new job for less than 90 days. They also cite the OSHA stat that 40% of all injured employees have been on the job for less than a year. They also note that “new employee” may not just be a new hire: “New employees include people who transfer to a new position, return to work after an extended absence, operate a new piece of equipment or implement a new procedure.” Check out the post for tips on this topic. Wow of the week – a little off topic, but check out this amazing video of the massive haboob (dust storm) that hit Phoenix on July 5. * Consumer Reports: Can you read this drug label? This entry was posted on Thursday, July 14th, 2011 at 11:03 am	and is filed under News roundups. You can follow any responses to this entry through the RSS 2.0 feed. Both comments and pings are currently closed.